ABC’s News reported: “Britain’s Catherine, Duchess of Cambridge, learning sign language as she meets with children at the newly established 23rd Poplar Beaver Scout Colony in east London on Dec. 16, 2014. The Duchess’s visit supports the Scout Association’s ‘Better Prepared’ campaign, which aims to help communities to deliver Scouting to two hundred locations across the UK where Scouting can have the biggest impact. 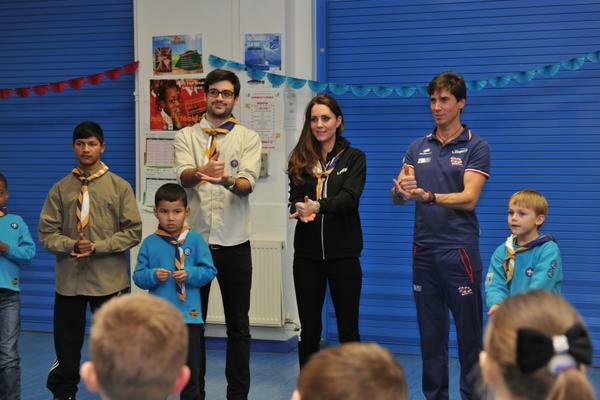 The pregnant Duchess of Cambridge got dib dab down to business as the guest of honour at a Beaver Scout meeting in east London. Kate visited the newly established 23rd Poplar Beaver Scout Colony in Bow to support The Scout Association’s “Better Prepared” campaign. Arriving at just before 7pm after getting stuck in traffic wearing a black scouting hoodie teamed with jeans and boots, she gave looked casual and ready to get stuck in. She then spent an hour helping six to eight-year-olds with activities to gain their Disability Awareness Award, including learning sign language before presenting the badges. …. Kate joined the 20 Beavers sitting in a circle and then, when everyone stood up, went around the circle, presenting each with a disability awareness badge.”Well done,” she told each Beaver. “Oh my gosh, look at all your badges,” she said to one. “How many? Have you been counting them? Then Kate joined all the Beavers in using sign language to say the Scout’s Promise – “I promise to do my best, to be kind and helpful and to love my world” – before singing along to their farewell song “Goodnight Beavers”. Asif Iqbal MBE, President of Harrow United Deaf Club was pleased to see a proactive role model, inspired to learn sign language and disability awareness with the Beavers. “I hope to see more deaf children and adults to participate in scout or local groups where everyone are welcome and communicate in sign language. Harrow United Deaf Club welcomes this move and is passionate in working with the community and ensuring all barriers are removed, promoting unity for all. Harrow United Deaf Club is also pleased to host their first youth club on Saturday 3rd January 2015 at The Bridge Centre, Harrow.”.